For those of us who love to keep life as simple as possible, it is great when we can take an attitude of something being all the same. Unfortunately, not all tungsten carbide rings are equal, making your shopping a little more difficult than you might have liked. However, shopping carefully does mean that you are going to find yourself with a quality product. What should you look for when it comes to finding perfect tungsten carbide rings? A high price does not automatically mean a good quality tungsten carbide ring, but a low price almost definitely points to a low quality one. As a guide, you should be looking at around the $190 mark as a starting point. Anything lower, and certainly down at the $50 range you can find on some websites, should be avoided before you even start to look at the other considerations. Tungsten carbide rings should all be made individually, and there are a number of factors to consider when looking at the quality of the craftsmanship. · Is the ring symmetrical? While two of the same tungsten carbide rings might look different due to them being individually created, the rings themselves should be symmetrical. · If you have a carbide ring with wood, meteorite, or another unique material in the ring, is it well set and professionally finished, with no seams or irregular meeting points? · Has the ring been crafted down to a good size? As a guide, greater than 2.5-3mm in thickness would indicate that the time has not been taken to create the best possible product. 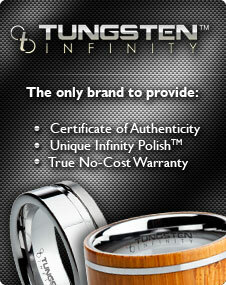 In short, your tungsten carbide ring should look flawless. You should be looking for tungsten carbide rings that are composed of around 85% tungsten, with the other 15% made up of carbon, and perhaps traces of nickel. Any shops or websites that do not hit these numbers or use a different material to create the carbide are likely to be selling a substandard product. If a company knows what it is talking about and is happy to discuss the composition of their tungsten carbide rings, then you can buy with some confidence. While it might not be possible to try on a tungsten carbide ring prior to buying it, especially if you are doing so online, you should follow all available guidance with regard to ring sizing to ensure that you get the perfect fit. Tungsten carbide rings, once produced, cannot be resized, so it is important you choose the perfect size for your perfect ring.